What, exactly is the Issa by Foreo? 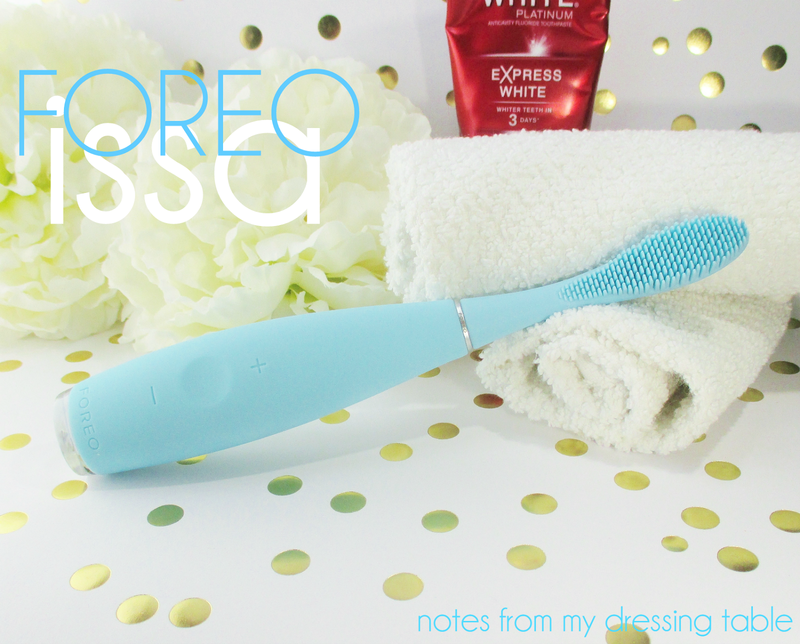 According to Foreo, the Issa is a "new type of toothbrush that feels different from standard electric toothbrushes as it uses silicone bristles with pulsation technology for both cleaning and a healthy gum massage." This stylish, ultra hygienic nonporous silicone electric brush unit is compact, fits nicely in the hand and is easy to hold, use and keep clean. This toothbrush has a built in timer that guides you to brush for the recommended two minutes, giving a series of pauses every thirty seconds to remind you to move to the next quadrant. The soft silicone bristles are designed to rub the teeth clean, rather than scratching them like standard nylon bristle brushes. 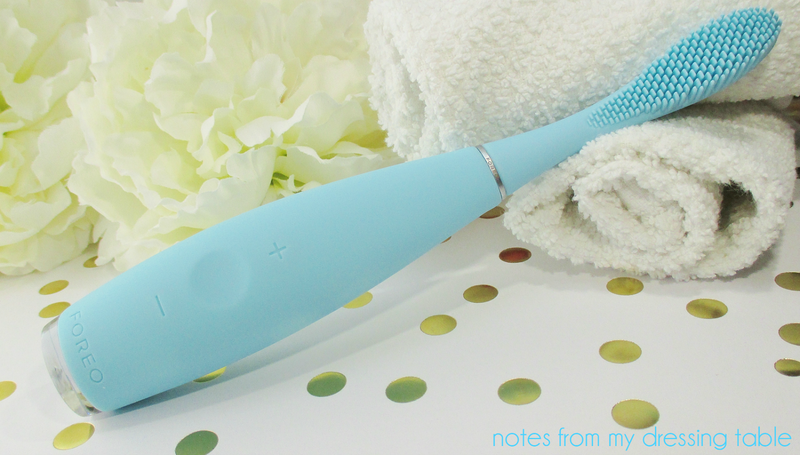 The soft bristles and pulsations give the gums a lovely, gentle massage. 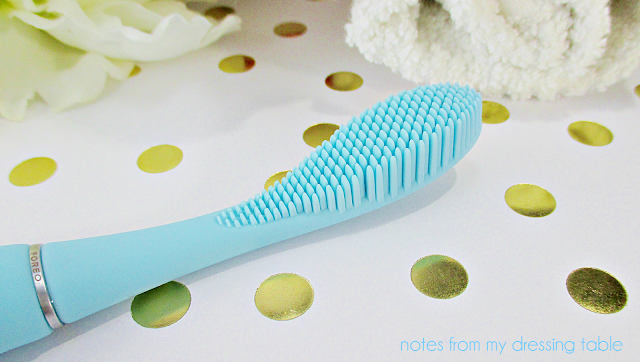 The large-ish oval brush head, up close with the silicone bristles. The brush head is easy to clean and, unlike standard nylon bristle brush heads only needs to be changed once a year. In the handle of the Issa are the controls. The buttons are fully integrated into the material. In the center is a dip, this is the power button. There is a plus and minus sign that, when pressed will increase or reduce the intensity of the sonic pulsations. In the acrylic foot, a light shines when the unit is in use and blinks when it is time to charge it up. On the back of the handle is the waterproof plug in port covered by a small flap. You simply lift the flap, plug in the USB jack, plug the USB into a device like a computer to charge. I charged my Issa on my laptop. A full charge only takes an hour or two and should last about six months. 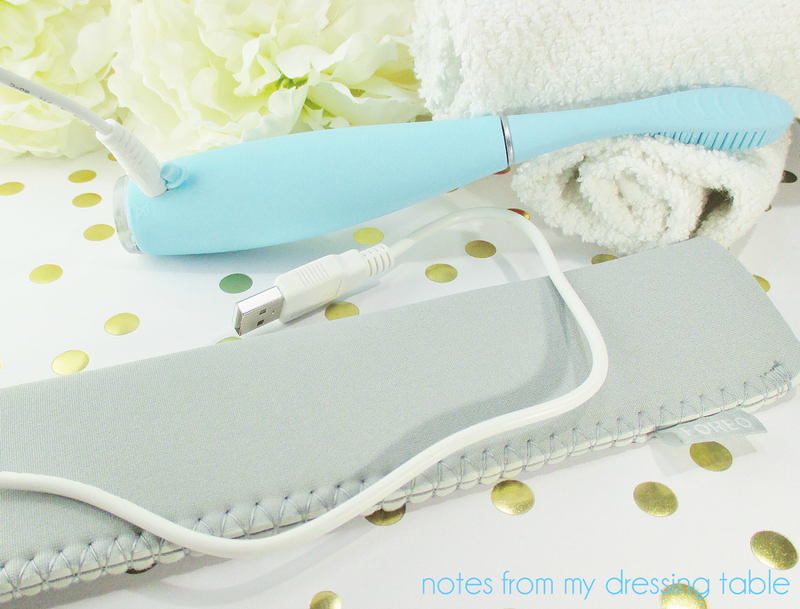 This brush and charger would be great for travel, as the charge not only lasts a long time, the cord is light and short and, since it plugs into a device to charge, you don't have to worry about packing an additional adapter, if you are heading overseas. Also included with the Foreo Issa is a neoprene sleeve that is great for travel or storage. The brush head easily detaches from the base unit for cleaning or changing. So. I have been using this brush for a while now and it definitely has it's pros and cons. Let's run them down. This is one stylish, good looking oral care device. The Foreo Issa is smoothly covered in coloured silicone, has that oval shaped head and at the bottom, a clear, acrylic foot from which shines an indicator light when the unit is in use and blinks when it wants to be charged. The unit charges fast and it holds a charge for a long time. The Issa is easy to keep clean and hygienic. 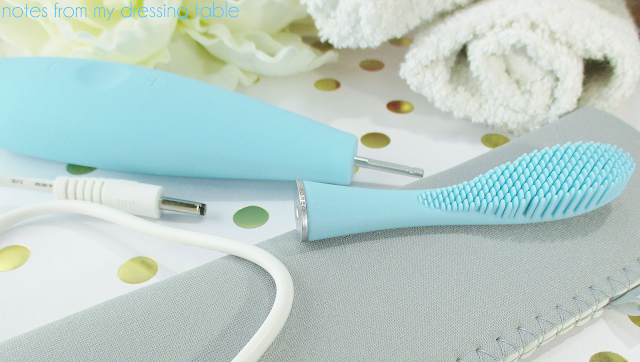 The soft, silicone bristles and sonic pulsations give the gums a lovely, gentle massage. The unit has a built in timer and gives a little pause every thirty seconds to remind you to move from quadrant to quadrant, for the recommended two minute brushing session. The brush head is a bit large and with my small jaw (it's small... you should see my dentist or hygienist trying to get in there to work on my back teeth) took a bit of getting used to. The brush bristles, while soft and gentle on my gums, doesn't clean as effectively as I had hoped. The bristles can't get in between my teeth, it struggles with cleaning the irregular surface of my not perfectly straight teeth and it misses a lot. My teeth just don't feel as clean after using it and I have to floss and rinse like I'm being paid for it to get leftover residue out from between my teeth. I have a small partial and this brush is useless for cleaning the little guy. I had to haul out my manual brush to clean it, every time I brushed. Oy. So, twice a day, I was hauling out two brushes and using extra toothpaste. Taking that much extra time... Nope. 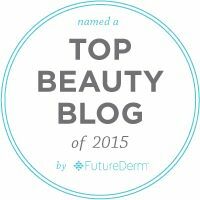 Bottom line, the Foreo Issa is a good concept that just doesn't work for me in day to day real life use. I'm back to using my manual brush. The Foreo Issa, $199.00 is available from the Foreo website. It comes in four colours. There is also a mini version for kiddos. Replacement brush heads are $24.90 and come in colours to match your brush unit. Or you could buy a contrasting colour for a fun, new look. Foreo is social! Visit them on Facebook, follow on Twitter and stalk them on Instagram. 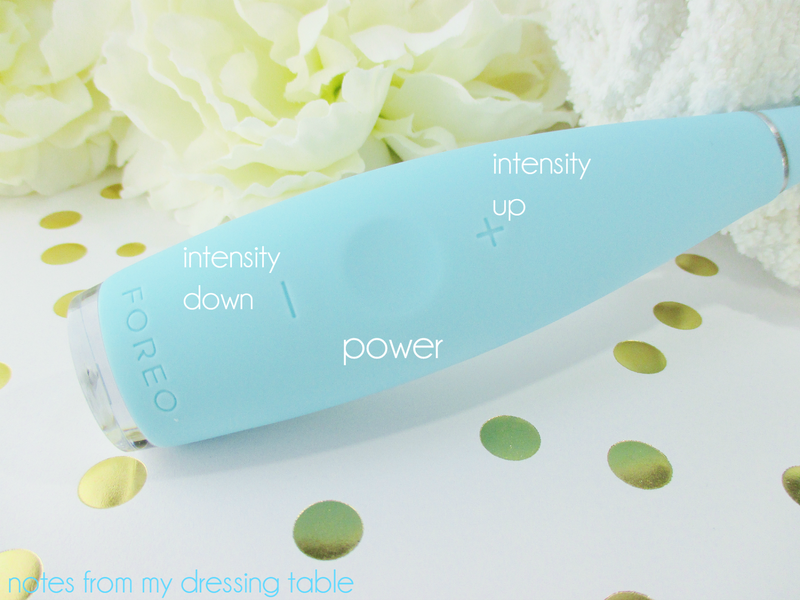 Do you own a Foreo Issa? What has been your experience with this device? Would you consider purchasing one? Please tell me what you think. I brush my teeth for about 8-10 minutes once a day-no sh*t. They have to use the pediatric xray thingys to get into my mouth. HAHAH! You and I are mouth twins! This thing looks very weird. I'm not sure it would give me the squeaky clean thing I crave. If you are after squeaky, this may not do it for ya. I really wanted to love this but alas... I'm back to my regular brush and my teeth are cleaner. Sounds and looks like an interesting oral device. Its way too expensive for me so I'll stick with my regular toothbrush. This might be a great gift for someone though. I will have my review coming very soon ! I love your pictures, too bad it didn't work out for you! It sounds like a good concept but what's the point if it doesn't clean well. I have been wanting to try this so badly, but the problems that you list on your Con list would make me hesitant to try it. Thanks for your honest review! I really appreciate that you broke down the pros and cons of why this really didn't work for you. So important! Your pro/con list was fantastic... really great information. I don't think this is for me, but it's definitely a cool concept! This is a really interesting concept, but yeah my mouth is also small so this would be a no-go for me. My dentist has to use the childrens sized xray things, because the adult ones just can't get in there - so I feel your dental struggles lol. 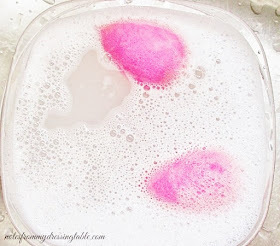 I use an electric Braun, and it works great! Interesting concept but I don't think it would work for me. I love my electric toothbrush. I was so desperate to try one of these, but the cost is hefty. I have a smallish mouth, too (ironic, I know!) and maybe I'll try the mini instead. I'm looking to replace my beloved Sonicare soon, but for the price of one ISSA, I can get another Sonicare for both myself and the husband. I really wanted this but I can see now it's too big for my mouth. The Oral B is the only one that fits comfortably for me. I just don't think this could do as great a job as a spinny brush with regular bristles. I do like that silicone don't hold on to bacteria as much though. I was super interested to see how well these would work! I'm still back in the dinosaur days with my regular ol' toothbrush, aha. I love my sonicare and the Oral B.
I was not really a fan of this one either. Struggling with my review now, because I am trying to think of ways to be nice about it. This sounds lie such a neat gadget, but I'm not sure it would work in my small mouth. IDK how well the large brush would work in my mouth, but it looks flipping cool as hell none-the-less! I hope that it rocks your socks. My advice, stick with your Oral B. I'm thinking of investing in a SoniCare. Yep. I was seriously bummed. I really wanted this to be fabulous for me. I'm thinking about the Sonicare. I'm back to dino brushing! I wish that this had been more successful for me. The hygiene part is a huge selling point. I just wish it did a better job brushing. I am in love with the design of the thing. But I'm back to my old standard toothbrush. Adult bite wing x-ray thingies make me gag and cry. I'm such a drama queen at the dentist. lol I'm thinking of checking out the SoniCare. It's supposed to be good and the brush head is better sized to my child like jaw. You're welcome. I enjoyed trialing the device and writing my post. Looking back, I wish now that I had requested the child's model. I wonder if the smaller head and thinner bristles would have made a difference?